This atmospheric holiday home exudes authenticity and has everything for those looking for rest and relaxation. 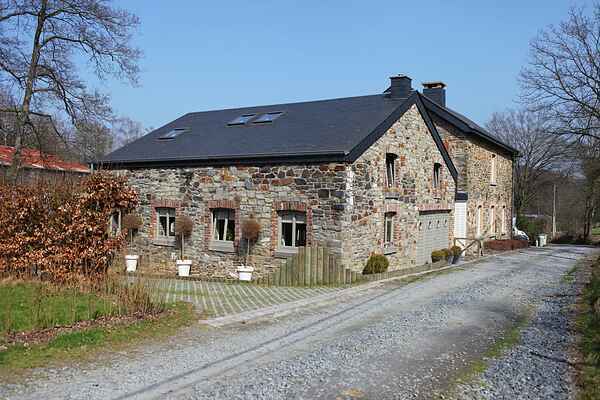 The holiday home lies in a unique location; next to a brook, and close to the forest in a very peaceful environment. The small stream that flows on the property adds a touch of poetry to the location. The forest road to the village of Saint-Hubert (at 4 kilometers distance) is particularly beautiful. The interior is decorated in a cozy and original way. You can find rest and relaxation in the Turkish bath with light therapy, infrared sauna, massage chair and solarium. On the beautiful terrace you can enjoy a barbecue during the summer. This holiday home is aimed at families. The area is beautiful with its forests and hills. Hiking trails start right from the house. Within a 500 meter radius you can go horseback riding, bowling and play tennis. At one kilometer distance there's is a fish pond. A little farther away are the cities of Bastogne (21 km) and La Roche-en-Ardenne (28 km). The Caves of Han-sur-Lesse (36) are also worth a visit. During the winter, there are cross-country skiing trails at 13 kilometers distance.